Written by: KristaG on December 15, 2017. Oh the opportunities this wreath contains! I’m going to start by completely outing myself: I love thrift stores! Especially some of the ones here in the city. While browsing the rows upon rows filled with random treasures and some understandable giveaways, I came across several holiday wreaths. To be honest, some of them were gorgeous and some of them…were downright scary! However, as my manager loves to put it, many of them “have some opportunities” so I scrounged around until I found one that I felt suited my tastes and began picturing my designs. 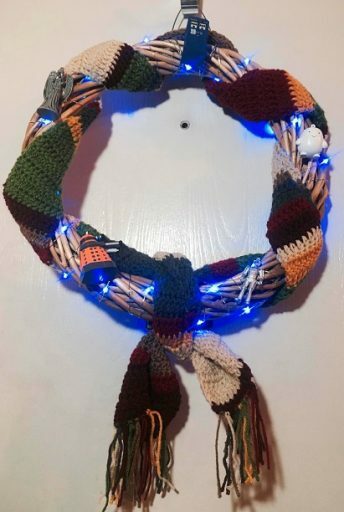 Though I am no Time Lord, I was determined to take the $2 rusted, somewhat worn, and tired Christmas wreath and use whatever regenerative powers I could muster to transform it into something any Whovian would love! 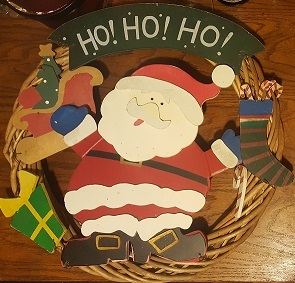 I decided to leave the big wire hanger that was originally on it, but the wreath itself is in great condition compared to some of the Christmas flotsam I pulled off of it! 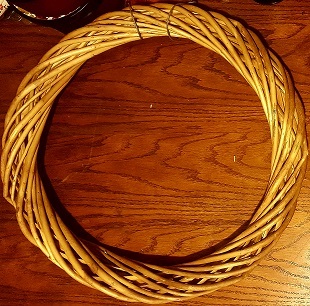 My first part of the project was to carefully remove the wooden accoutrements as the wires holding them to the wreath were quite rusted and I wanted to see what the wreath itself looked like underneath. At the worst, I’d wasted $2 and it would be ruined underneath. The best outcome would be that I had just saved myself $15 and a walking trip to Hobby Lobby to buy one that was similar. Upon removing the wooden pieces, I was thrilled to discover that, other than some dirt and a few paint rubbings, the wreath itself was in great condition! With this discovery, I started playing around with some ideas. Should I spray paint it a specific color? Should I make it light up? What kind of ribbons should I use? Should I use ribbons? Should there be a T.A.R.D.I.S.? So many ideas to explore! One thing I knew for certain, however, is that I wanted a 4th Doctor scarf. Though Tom Baker is not my favorite out of all of the regenerations of The Doctor, his scarf is just as iconic as David Tennant’s overcoat and Converse shoes, Matt Smith’s fez and bow tie, or Peter Capaldi’s sonic sunglasses and guitar. Now, though I have many friends who can knit, I am not a part of that crowd and my crochet skills could use some work, too (I can, however, sew, cross stitch, embroider and many other things like no tomorrow!). Due to this, I wasn’t entirely sure how I was going to come up with a knitted scarf at all, much less one that wasn’t going to be ridiculously large on a wreath – especially in time for the holidays! My local friends, unfortunately, were also booked solid so I did the next best thing: I took to the Internet. I’ve got to tell you right now that Sara from AriesWings on Etsy.com is an extremely talented lady. She had exactly what I wanted, got it to me extremely quickly, and it didn’t cost me an arm and a leg to get it! Blue fairy lights, Doctor Who mini ornaments (T.A.R.D.I.S. 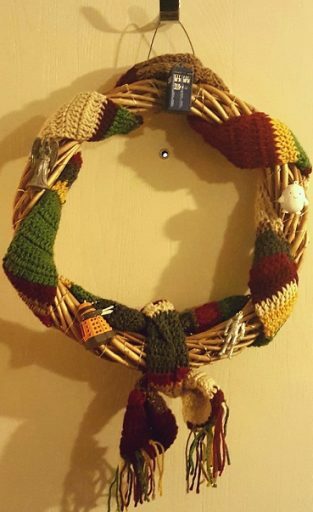 not pictured), and 4th Doctor scarf all waiting to be transformed into a Doctor Who themed wreath! Though there are many, many different Doctor Who inspired ornaments available, the ones I finally settled on were from the Kurt Adler Doctor Who collection and are officially licensed by BBC. I specifically chose the smaller sized, plastic ornament sets (about 2.5” tall for the tallest ones) and chose my favorites for use on my wreath. I wanted to make sure that the T.A.R.D.I.S. took the center spot at the top of the wreath and then used 4 of the different villains to fill in the surrounding area, making sure to leave room for the bright blue fairy lights that I had sitting around just a little sparkle. I played around with the placement of both the scarf and the ornaments after I wrapped the lights just the way I wanted them until I was happy with the results. Finally got everything the way I wanted it! When it comes to putting together the wreath, it took me about an hour to an hour and a half to get everything the way I wanted it (not including waiting on things to arrive in the mail or the removal of the original decorations). I started by wrapping the lights first and carefully securing the battery pack to the bottom of the wreath. Next, I played around with the scarf. That part took me awhile to get to where I was happy with it simply because I wasn’t entirely sure which “look” I wanted to go for overall with the scarf. I also fiddled around with the concept of adding snowflakes, some wintry-themed floral picks, and a few other little additions. In the end, I scrapped all of that and decided to focus on keeping it simple and utilizing the scarf even more. Once I was happy with my design, the rest took seconds to complete. I removed all of the strings from the tops of the ornaments and simply hot glued them in place. This way, the wind can blow and doors can be open and closed as much as we want without worry of things falling off! Due to the complex I live in, however, this particular wreath will be hung indoors – at least for this year! The regeneration is complete! Much like when The Doctor regenerates, I can hardly recognize it from how I saw it last! Though I’m definitely not as good at this as my mother is, I’m pretty pleased with the final results. As you can see, I chose to keep the wreath it’s natural color and let all of the decorations do the talking (Note: click on the pictures to see a larger version). I felt that the natural tones matched the brown in my “Doctor Who and the Dalek Invasion of the Gingerbread Town” Advent calendar so it was a nice way to tie it into my other “Wholiday” décor for this year. If you’re in need of other inspirations for your own wreaths, there are tons of them online. Some do utilize ribbons, bow ties, blue and white ball ornaments, Daleks, T.A.R.D.I.S. lights, and even blue tinsel wreaths! 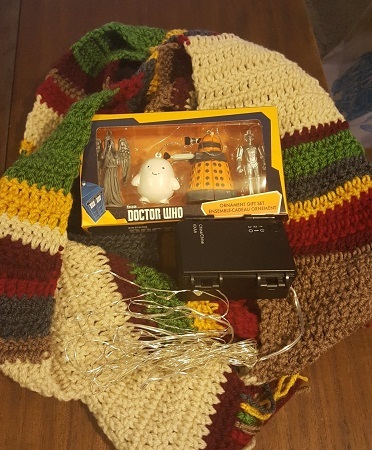 I was somewhat amused to discover that my 4th Doctor scarf is also a fairly common element in other people’s designs, but I guess there’s no harm in crafty geeks thinking alike.